Barlowe/Barlowe/Jam; Caillat/Swift; Lindsey/Rose/Swift; Rose/Swift; Swift. Very Good. In very good packaging. 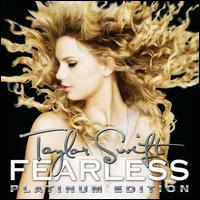 Swift, Taylor-Fearless (W/Dvd) (Spec) by Swift, Taylor. Very Good. Very Good condition. Audio CD. Case Very Good. 2 disc set. Quality guaranteed! In original artwork/packaging unless otherwise noted. Barlowe/Barlowe/Jam; Caillat/Swift; Lindsey/Rose/Swift; Rose/Swift; Swift. New.